I’ve got serious feminist rage at the moment. It feels like everywhere I look, I’m seeing opinions that are derogatory to women and the feminist cause. But – shock horror! – they’re not the opinions of men. They’re the opinions of women who perhaps need to reacquaint themselves with the definition of feminism in the first place. I’m not talking about those who claim to not be feminists because they think it means they can’t wear make-up or let boys put up their shelves (it doesn’t, but that’s a whole different blog). I’m talking about those who think men have no place in derby. I am female, I am a skater in a co-ed league and every time I see or hear a rant bemoaning men playing derby and citing feminism as the reason, I feel like smashing my head against a wall. Before we get started, I think it’s pertinent to point out that I am not saying women should be forced to play co-ed roller derby, and this is not a response to those who simply think most scrims and bootcamps becoming co-ed is a problem (people should have a choice). It is aimed squarely at those who don’t like co-ed or men’s derby for ‘feminist’ reasons. Firstly, let’s look at why roller derby is considered to be a feminist pursuit in the first place. 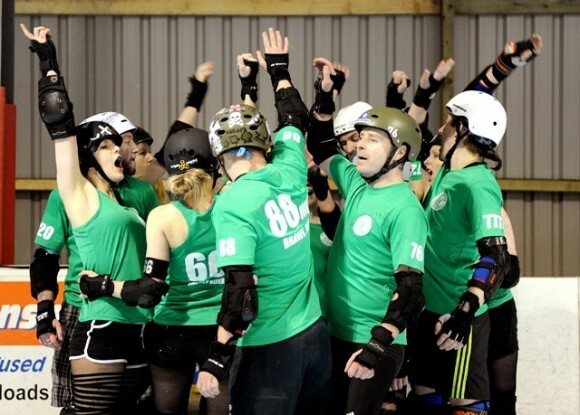 If we ignore the fact that derby began as a co-ed sport (why not have a watch of Windyman’s fantastic documentary of the history of roller derby here), it is a full-contact, highly skilled game that is currently the fastest growing sport in the UK. Oh, and it’s mostly played by women. The nature of roller derby allows the women who play it to redefine what being feminine really means, and it has done a great service to the feminist cause. But I don’t believe excluding men is helping that cause – in fact, quite the opposite. Whilst a gendered focus was essential to get this far, to have a chance of achieving its goals feminism as a movement needs to redefine itself as sexless, and position itself in a way that is more relevant to modern society – people as people, not men and women. Don’t get me wrong, misogyny is alive and well and there is still some way to go, but I believe this is partly due to a societal construction of gender that portrays men and women as distinct in more ways than simple biology. This may be a bold claim, but despite its linguistic roots, feminism is not just about women. It is about equality. In its infancy, it focused specifically on the lived experience of women because politically, economically and socially the female of the species was considered inferior to the male. But I’ve got news for you – we’ve come a long way, baby. Feminism is flexible, it needs to move with the times and now we’re within spitting distance of the endgame it’s time to think about what equality truly means. Creating something for women and women only is just as bad as if it were reversed, and is simply working to perpetuate what feminism is trying to fix. Yes, men’s roller derby is on the rise. And yes, many bootcamps and scrims are now co-ed, which can probably be attributed to simple business sense. But no, they are not going to ‘take over’ and no, men’s derby is not anti-feminist. In fact, I am here to argue that it is very strongly the opposite. Roller derby is rising in popularity so quickly that people from all walks of life want in, and those women who have been playing for years should be very proud of this fact and how they have helped develop this burgeoning game. As with everything in life, sport should not be gendered – just as women should be able to play football if they wish, so men should be able to play roller derby. Yes, there are chauvinistic pigs in men’s derby as in all walks of life, but having played with both genders, I can safely say that a large proportion of the men who play are very respectful of the women’s game and its feminist roots, and if you think that the men’s game is really going to ‘take over’ then you can’t have much confidence in the women’s game in the first place. None of the ‘feminist’ arguments against men’s and co-ed derby make any sense to me, and mostly just seem to be of more detriment to the women’s game than anything the men’s game could do. So before you start ranting about the dreaded Y chromosome coming in and taking over ‘your sport’ just stop and think about what you’re saying. You’re espousing anti-feminist views under the guise of the feminist cause. Patriarchy is not cool, and by extension, neither is matriarchy. In the much needed struggle for equality, we all need to be working towards the same goal. To summarise, if you don’t want to play co-ed roller derby then fine. That’s your choice, and you have every right to make it. But please stop publicly misappropriating feminism in the process. And if you don’t want to play with men because you think they’re too aggressive and hit too hard, then please, for the love of God, make sure you avoid ever playing any high-level women’s derby. 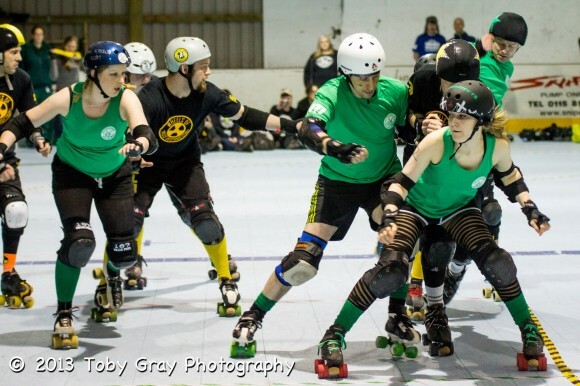 This entry was posted in Experiences, Roller Derby by LouiseyRider. Bookmark the permalink.